Julie C., the momma, and blue.ridge.girl. Congrats to all! Yea! 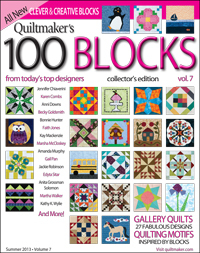 Today is my stop on the Blog Tour for Quiltmaker's 100 Blocks (Vol. 7). 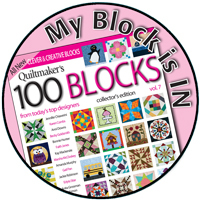 I was excited to have my block included in this edition. There I am, Block #652 on page 47. Sorry about the confusion with the wrong blog name/address by my block. When I submitted my block early last fall I was still blogging with my sisters and hadn't thought about that being an issue. Oh, well. It all works out in the end, right? Last year, while I was in the throngs of quilt club block making I came up with this design. It's not anything innovative or ground-breaking, but sometimes a little tweak makes all the difference. After making a block for one of my ladies I decided that it needed a little extra punch. So I chopped it down, added the white skinny strip and then added the framing border. I love the addition of the skinny white strip. In my mind that gives it the extra pop it needs. Here is a little mock up of my block in and edge to edge design. You could definitely make this design in a million different ways. I sure did! And here is the quilt I made out of my red blocks. If you didn't know already, I LOVE red quilts! 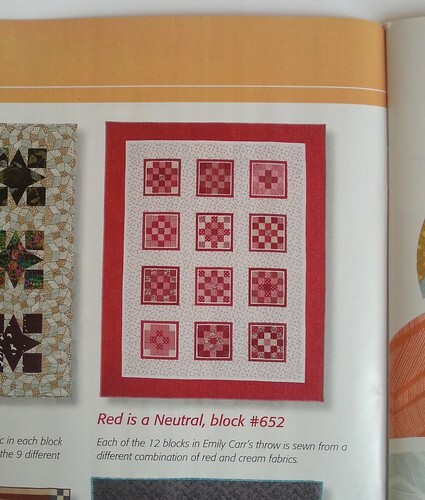 I even have an entire pinterest board dedicated to them, so this is my nod to traditional red quilts. All the blocks are made with the same layout, but as you can see value placement will changes the look of the block as well. Would you like a chance to win a copy of the magazine?? I've got extra copies to send out! (And I might even throw in some fabric scraps as well.) All you need to do is leave a comment on this post. Maybe tell me what kind of scraps you'd be interested in. I'll pick winners on Monday. If you want more chances to win, become a follower and leave a 2nd comment telling me so. 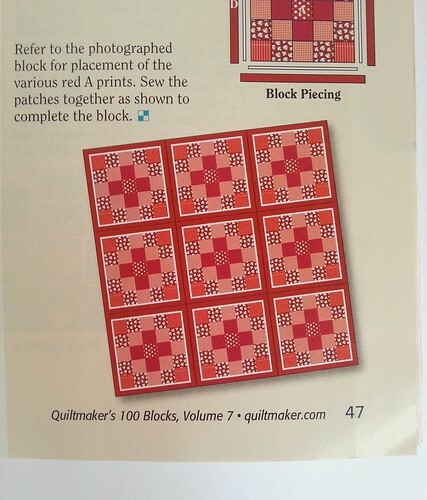 Don't forget to stop by the Quiltmaker's Blog as well. They are doing a bunch of giveaway's all week. Congratulations on having your block in the magazine ~ how exciting! So exciting to be published Emily! 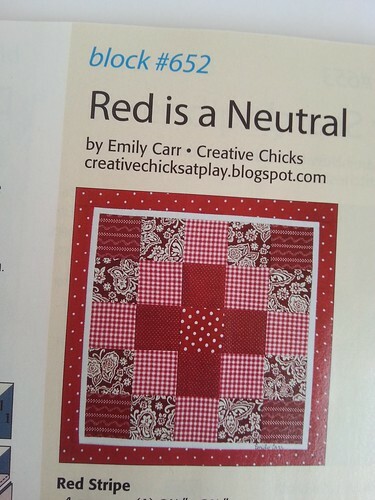 Hooray for you :o) I could not agree with you more about red & white quilts...they just have a quiet goodness about them! I think I'm one of those rare people who dislikes red. I love using blue and green scraps in my quilts. Congratulations on having your block included. Great samples of different color ways. Anything blue is is lovely. I love the red blocks. I have always wanted to make a red quilt like that! Congratulations and thanks for the chance to win a copy! I use my scraps for applique projects. I would probably use them for a lot more if they were organized! I enjoy seeing what you make. I can eventually find a use for almost any scraps. I love all scraps - I love red and I have very little orange! I love your red block. It's my favorite color. I like all scraps. It's fun seeing new fabrics I don't have. I am a follower now. Thanks. I do love your red quilt. Congrat on making it to the big time -being published. What as accomplishment. What a fun block! Glad I found your blog. I'll be browsing through it for the weekend. That, and your red quilts pinterest board. Scraps? Bright colors are my thing. Love aqua and yellow especially. I like all scraps! You never know what could look good together. I like your scrappy trips quilt with all the warm colors. Thanks for the chance to win! How exciting, you've been published! Love seeing all your projects! I could use a couple sewing days too! Looking forward to summer and now schedule. Yippie! Congrats on having your block published. I love all kinds of scraps. I have the hardest time throwing any away! Very exciting that you were published!! You must be very thrilled about that. I love any kind of scraps and would welcome whatever you may send. Thanks for the chance to win a mag too!